A long competition season and varying surfaces can take their toll on sport horses. Veterinarian and professional farrier Dr Stephen O’Grady explains the importance of good quality hoof care in the competition horse. The equine hoof is unique, as it is comprised of a group of biological structures that follow the laws of biomechanics. The farrier is a major asset during the show season as he or she can be proactive in maintaining the health of your horse’s feet and thus preventing lameness. The biological structures of the hoof and the biomechanical focus (red circle). There are three very important aspects of farriery science that the farrier will use to keep your horse sound, which are trimming the foot in conjunction with the size and placement of the horseshoe. Competition horses may start out with reasonable foot conformation, but as the season starts the farriery can change and many horses are shod with various specialty shoes, wedges, pads, pour-ins, etc. as a means of protection, and perhaps, to enhance their performance. As the season progresses and the workload increases, the sole thickness starts to decrease and the feet become softer from multiple baths; now the farriery that was applied for protection may be causing pressure on the thinner, softer structures of the foot, thus becoming somewhat detrimental. Furthermore, the horses continue to be trimmed and shod on a monthly basis and the change in the integrity of the hoof structures without investigating can cause horses to be over-trimmed. Additionally, the structures of the foot deteriorate further as a result of the workload, and many horses become foot sore. Typically, a farriery session will begin with an evaluation of the conformation of each hoof from the front, side, and behind to observe the height of the heels. Next, the farrier should observe the horse in motion to see whether the horse’s foot lands heel first, flat or toe first. All this information is considered and evaluated before the farrier begins shoeing. Regarding the trim, many farriers no longer use the term ‘balance the foot’ – which has no meaning – and have begun to use guidelines or landmarks when approaching the trim. A closer look at these three guidelines, which are all interrelated, will help to show their importance. If the dorsal (front) surface of the pastern and the dorsal surface of the hoof are parallel or form a straight line, then the bones of the digit (P1, P2, P3) are in a straight line, and the force from the weight of the horse will go through the middle of the joint. Furthermore, and equally important, if the hoof-pastern axis is straight, the weight will be distributed evenly on the bottom of the foot. The second guideline is the center of rotation (COR), and as the COR is located a few millimeters behind the widest part of each foot, it allows the farrier to apply appropriate biomechanics to each foot. The foot is trimmed in approximate proportions on either side of the widest part of the foot, which provides biomechanical efficiency. Lastly, one should trim the palmar section of the foot to the base of the frog or trim such that the heels of the hoof capsule and the frog are on the same plane. Adherence to this guideline keeps the soft tissue structures (frog, digital cushion, ungula cartilages) within the hoof capsule, which are necessary to absorb concussion and dissipate the energy of impact. We must remember that heels do not grow tall, they grow forward. 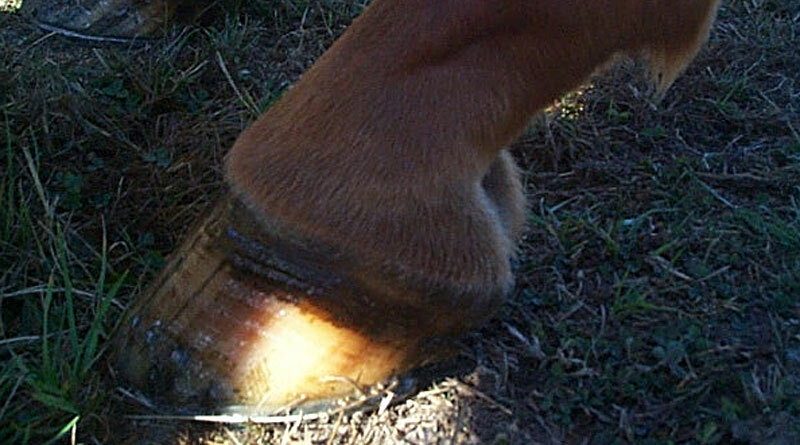 If we allow the heels to migrate forward, the soft tissue structures will be forced backward out of the hoof capsule. Furthermore, as the heels migrate forward, the weight is placed on the bone and lamellae, thus bypassing the soft tissue structures of the foot. Allowing the heels to migrate forward also decreases the ground surface of the foot. An example of this guideline is shown below, where the palmar foot was trimmed appropriately and a size larger shoe was applied to properly distribute the weight. The three guidelines outlined above can be applied to any foot, and they serve as a basis for maintaining a healthy foot and a basic starting point for applying farriery to a horse with poor foot conformation or one with a distorted hoof capsule. The below image illustrates a hoof where all three of these guidelines have been applied. Dr Steve O’Grady is both a veterinarian and a professional farrier. He learned the farrier trade through a formal three year apprenticeship under “Hall of Fame” farrier, Joseph M. Pierce, of West Chester, Pennsylvania and then practiced as a professional farrier for 10 years. He then returned to school, attended Haverford College and went on to graduate from the University of Pretoria, Faculty of Veterinary Science in South Africa with a DVM Degree. He currently operates Virginia Therapeutic Farriery in Keswick, Virginia which is a referral practice devoted to equine foot disease and therapeutic farriery. Here he combines his skills as a veterinarian and a farrier to better understand and treat problems of the foot. He also operates a consulting service where he travels worldwide to treat complicated podiatry cases. He has published 33 peer-reviewed papers in the veterinary literature, numerous papers in the farrier literature, written 18 book chapters and edited two editions of Veterinary Clinics of North America on equine podiatry and therapeutic farriery – all resulting from his extensive work in equine podiatry. He is currently in the process of editing a textbook on Farriery to be published in 2017. In 2003, he was inducted into the International Equine Veterinarians Hall of Fame and in 2009; he received the AAEP President’s Award for his work in farrier education. Dr. O’Grady joined Palm Beach Equine Clinic during the 2015-2016 winter seasons as a consultant in therapeutic farriery. I am surprised to see that you used a shod horse as an example for the importance of the farrier`s influence biomechanically as to the health of the horse. I have always considered this edition news worthy because of its holistic approach to horsemanship. I do not consider shoeing a horse as a natural approach to having a horse just because of the acceptance of shoes in the horse show world. I have found a better way. Thanks for pointing out that farriers are a major asset during the show season as he or she can be proactive in maintaining the health of your horse’s feet and thus preventing lameness. I think that it would be really important to have a farrier that could provide lameness reducing horseshoes. I feel like that would be really important to keeping your horse healthy and happy as well as maybe helping to extend their life.